1 of 1 Heat oven to 300 degrees . 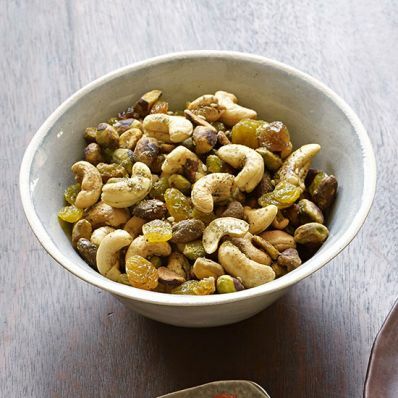 In a large bowl, combine shelled pistachios, cashews, raisins, olive oil, Za'atar seasoning, salt and pepper. Spread mixture on a rimmed baking pan and bake at 300 degrees for 15 minutes. Per Serving: 62 mg sodium, 14 g carb., 5 g pro., 2 g sat. fat, 2 g fiber, 0 mg chol., 13 g Fat, total, 176 kcal cal.